With Christmas fast approaching, you might be thinking about how you’re going to decorate your home or office and spread the cheer this season. But if the thought of pulling out a dusty plastic tree and putting up the same decorations you’ve had for decades isn’t so appealing anymore, you might consider breaking out of your rut and giving your family or colleagues a brighter, healthier, Christmas this year—with real, living plants. There are many species of plants that people all over the world use and share as part of celebrating Christmas. There are even quite a few species native to Australia that that can fill your home with seasonal ambiance for the holidays. With the vibrant colours and smells of living plants, it’s easy to get your family in the mood for Christmas festivities, and bring a breath of fresh air into your home at the same time. One of the most famous of all Christmas plants is the poinsettia. There are over 100 varieties of poinsettia, but the most popular varieties are the ones rich in deep red hues. Poinsettias are recognisable by the shape of their ‘flowers’—which are actually not petals at all, but leaves. At this time of year, they’re often sold in decorative pots and with a sprinkle of glitter, but their striking natural colour is so vibrant that they serve well enough on their own as centrepieces and as decorations inside and outside the home or office. Poinsettias are used worldwide at Christmas time, despite that they originated in Mexico and don’t tolerate the cold weather or frost. The good news there is that most varieties are well suited to the warm temperatures and long hours of light in Brisbane’s summer weather, so they’re a good choice for an Australian Christmas—but keep in mind that they won’t do well in fierce heat either, so be sure to place them somewhere nice and protected. Christmas Bells, like poinsettias, bring a bold pop of Christmas cheer to any space—and an Australian native, they’re the perfect decoration for celebrating the season in Brisbane the natural way. With beautiful bell-shaped blossoms in rich reds and yellows, these wildflowers have been adorning Christmas tables in eastern Australian regions since the 1800s. Christmas Bells are a species of lily, and are a true wildflower found in warm, wet climates in coastal New South Wales. Despite their beauty, they’re usually only cultivated in home gardens by native plant enthusiasts, but they’re grown commercially throughout the country for use as Christmas decorations and gifts. They’ll do well in Brisbane with a bit of water and some infrequent maintenance. 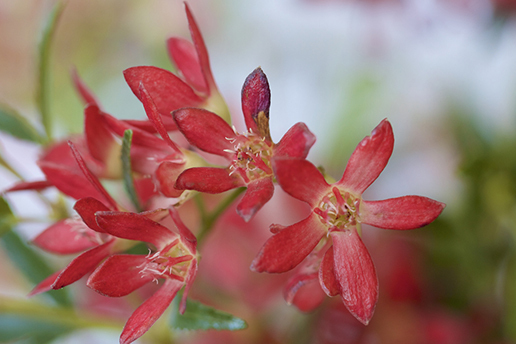 With the hardiness you’d expect of an Australian native, they flower at Christmastime and their colour doesn’t fade, making them both a heart-warming ornament and a good environmental choice for your home or office. Queensland’s subtropical climate is home to one of the most charming Christmas plants of all: our very own native Christmas Orchid, Calanthe triplicata. A fast-growing evergreen with bright white, star-shaped flowers, this festive orchid prefers heavy shade and will live happily in a pot inside your home or office throughout the Christmas season. It’s also a good alternative to traditional Christmas plants like Star of Bethlehem (Ornithogalium umbellatum) which can be toxic, especially to small animals, and are now considered noxious in many areas. Christmas Orchid is a famously high-performing potted plant, and makes an excellent Christmas gift in itself. With a delicate scent and snowy blossoms, it’ll pair well with the rest of your Christmas decorations while it delivers more than its weight in clean, fresh air—and it won’t look out of place if it stays right where it is throughout the rest of the year. In many countries, Rosemary has held a place in Christmas tradition for centuries: while there are many interpretations within Christmas lore, Rosemary was supposed to play an important role in the nativity story. With the gorgeous aroma of a woody, perennial herb, and a wide variety of uses in cooking and home remedies, it’s no wonder that it’s again increasingly sought after as a Christmas plant. Traditional Rosemary (Rosmarinus officinalis) is available in Australia at Christmastime, but our very own coastal Rosemary (Westringia fruticosa) makes an even better choice. Hardy and densely packed, it can be clipped into desired shapes—even serving as a miniature ornamental Christmas tree in homes or offices short on space. One of the most famous symbols of the Christmas season is holly—and this is understandable in European holiday traditions, which draw on the bright red berries it produces in the winter. But while it’s a common component of many Australian decorations, it’s usually in plastic form: holly, whether it’s Australia’s native holly, or traditional European holly, doesn’t produce berries at Christmastime. But there’s an alternative to this in our very own landscape: Christmas Bush (Ceratopetalum gummiferum). 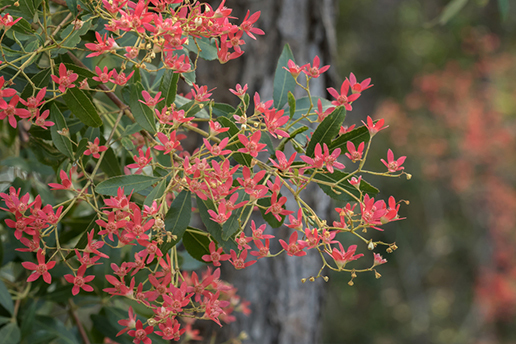 This gorgeously vibrant shrub features white star-like blooms in spring, and red calyxes in summer, delivering rich colour even in the heat of Brisbane’s Christmas season. It does prefer full sun, but its festively coloured blooms make a great addition to gift baskets, flower arrangements, and garlands, so it’s a truly beautiful way to bring real (and natural) Christmas cheer to your home or office. Not all your Christmas plants need to be in traditional red and green—colours which, after all, stem from European traditions in the winter. You can embrace our Australian culture and still cultivate seasonal festivity in your home or business with plants from your very own backyard. Many Australians looking for a living Christmas tree will find what they’re looking for in introduced species that are specially grown for the occasion, like firs and pines. But many others will think outside the box—or out the back door—and choose fallen eucalyptus boughs or driftwood to decorate with baubles. These beautifully scented, pale-coloured branches bring a fresh, beachy sweetness into your home or office, and tend to look much more appealing against your décor than introduced species or artificial plants. Ferns and fronds are also a good option, bringing lush, green vibrance and plenty of clean air inside—and they’ll stay alive and thriving for the long haul if they’re potted properly. Christmas comes but once a year: so if you’re not sure about making a long-term commitment to maintaining your plants, there’s a much easier option. At Prestigious Plants, our experienced plant designers are ready to help bring some cheer to your home or business with living plants—and we’ll take care of them for as long as you want them. Contact us anytime for more information on how to improve your health and happiness with custom-designed interior plantscapes, and we’ll be happy to help. "The beauty about Prestigious Plantscapes is that I don’t ever have to worry about our plants and how they look. It just gets done. The office looks great and we have been relying on their service for many years now." "Their customer service is simply outstanding. They feel like family: they are friendly and warm, and always willing to go the extra. We have never had to complain about anything, and any requests get looked into immediately. They are also subtle, they sweep in and out, they are flexible and they can work within a budget. I would absolutely recommend them."